Both Croatia and the Czech Republic saw success in Saturday’s doubles final here at Kungens Kanna & Drottningens Pris. It was a Balkan showdown in the boys’ final. The Croatians Bartol Borse and Luka Mikrut proved to be the better duo, beating out Luka Jovanovic (SRB) and his partner Bor Artnak (SVN). Shortly after the price ceremony of Drottningens Pris it was once again time for Linda Fruhvirtova and Barbora Palicova (CZE) to play. This time however on the same side of the net in the doubles final. They faced the top Europe ranked Russian Diana Shnaider and her Estonian partner Aurelia Riga. The Czech duo eventually managed to take the win after two tough sets 7-5, 6-4. Both winning pairs had their names engraved on Peter Wallenberg’s beautiful price of honour. The consolation tournament was also concluded on Saturday, and we are happy to report that the Swede Tilde Strömqvist won against Aysegul Mert (TUR) in the girls final, 4-6, 6-3, 10-2. 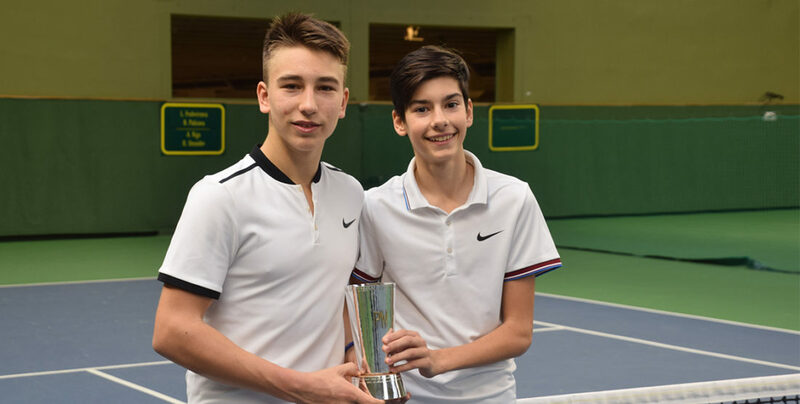 In the boys consolation final the Croatian Dino Prizmic won in a dominating fashion against Mikalai Bankou from Belarus (6-2, 6-0).